Enterprise IT still struggles to make the necessary mindset, organizational structure and methodology changes needed to be Agile. Transitioning to Agile doesn’t need to be painful. 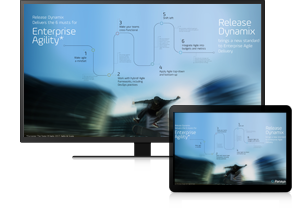 See how today’s Enterprise Agile Delivery solution, lets you deliver applications and software with confidence at a faster release cadence. With Enterprise Agile Delivery value gets delivered in smaller chunks but more frequently. By providing more collaboration and visibility into delivery pipelines of value streams, risk is managed effectively and value is delivered more often and safer.